Pred kratkim sem zmagala v izzivu pri TTCRD, kar me je zelo razveselilo. Da pa bi bila novica še lepša, so me povabili v gostovanje, kot gostujočega Designerja. Povabilo sem z veseljem sprejela. V ta namen sem izdelala voščilnico z digi štampiljko sponzorja. Tako se je v središču voščilnice znašla štampiljka Little Fairy iz čudovite zbirke Crafts and me. Pobarvala sem jo s Prismacolor barvicami in dodala bleščavo na krila s pomočjo Wink of Stella. Ozadje sem pobarvala s Promarkerji. Uporabila sem še nekaj rezalnih šablon (Spellbinders, Cart us, Joanna Sheen) ter DP in kristalčke iz domače zaloge. Barvanje s temi barvicami ti res leži. Krasno pobarvan motiv in sestavljen v razgibano voščilnico. Beautifully colored image and great accents. Thank you for joining us at Connie Can Crop. 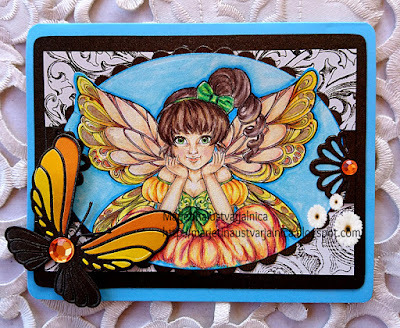 LOVE your image and colouring, LOVE your butterfly and warm colour combo too! Beautiful, and I love your butterfly. Thanks for joining us at Creatalicious. Good luck. Maggie, DT. Your coloring is lovely, as is the entire card! Thank you for sharing it with us at PIP Challenges. lovely! Thank you for joining us at Connie Can Crop's monthly challenge. Good luck. Beautiful card, love the image and design, lovely coloring! Thank you for sharing with us over at Love To Scrap! Hope to see you again! Thank you soo much for taking part in our "anything goes with optional mythical creatures” challenge over at Creatalicious & good luck in the draw. Beautiful card! Thank you for joining Connie Can Crop's monthly challenge!